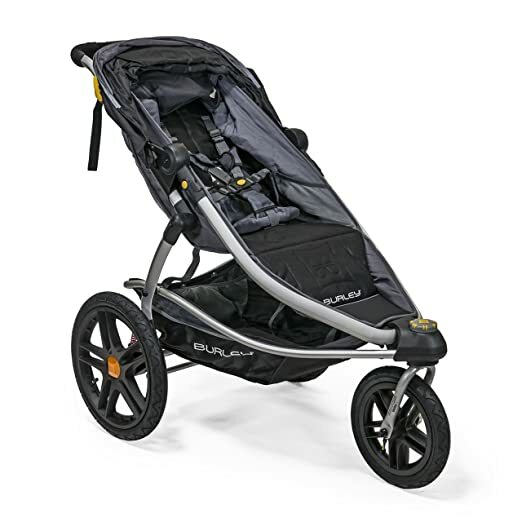 Burleys top-of-the-line child carrier is loaded with premium features to maximize comfort, performance and safety. The DLite has seating for one or two children and features bowed-out sides for extra shoulder room, adjustable suspension, Spring Integrated Technology (S.I.T. ) seating to prevent tangled and limp straps, and all-kit compatibility for optional conversion from biking to strolling, jogging or skiing. 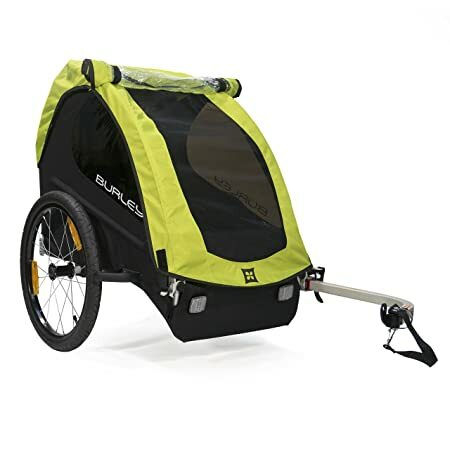 Share your love for the outdoors with your little ones in the Burley DLite. One of the lowest priced, ASTM-certified child trailers on the market today, the lightweight, bike-only Burley Bee Child Trailer keeps the little ones content while you buzz around the neighborhood. 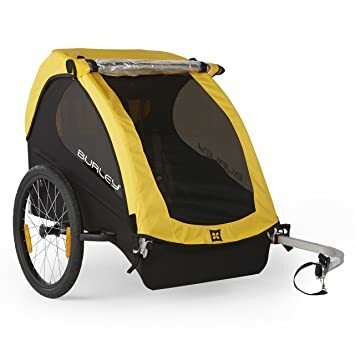 The Burley Bee comes with the innovative Flex Connector that allows the bike to lay flat while the trailer remains upright. Also new: tinted side and rear windows with integrated UPF 30 for sun protection, a lot more storage space, and side battens that create a barrier between the wheels and your child. It weighs only 20.5lbs and protects up to two passengers with its full internal roll cage, heat-treated aluminum frame and 5-point safety harness. Convenient rear tailgate provides easy access to cargo, 20″ quick-release wheels roll smoothly and compact folding design flattens the trailer for storage or transport. 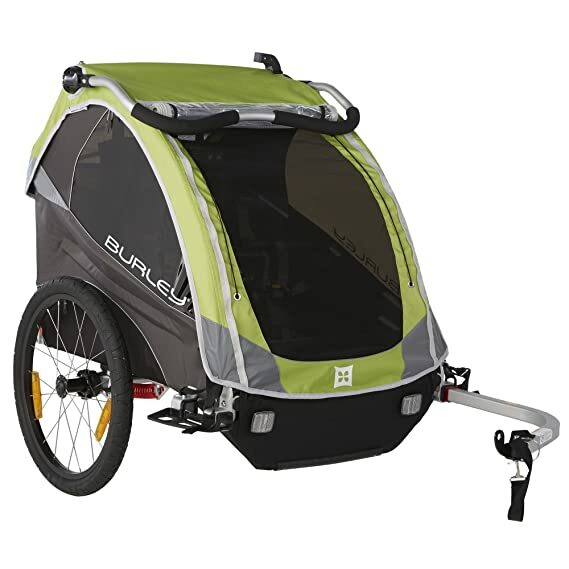 Take your burley on even more adventures with the double Jogger kit. 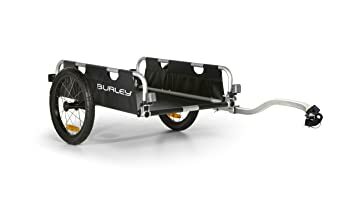 The double Jogger kit attaches to the existing mounts on your burley trailer and converts it to a Jogger, making it easy for families to get out and explore more together. The utilitarian choice for pulling larger loads. Haul up to 100 lb. 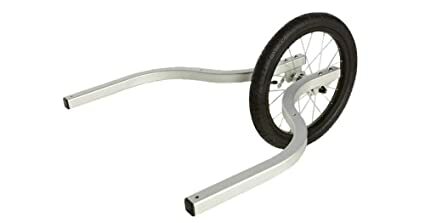 easily with a balance point designed to reduce torque on the bike and a hitch that is ideally positioned to provide superior tracking and stability. Open front and back makes it easy to haul long loads.